Recently, two African American Studies students visited Ghana to deliver pencils and other school supplies to schools as part of a non-profit organization they founded called The Pencil Project. 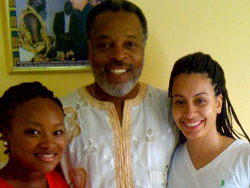 The idea for the non-profit organization originated during a July 2009 summer trip that Hannah McConn and Randryia Houston took as part of the African American Studies Study Abroad Program in Ghana. 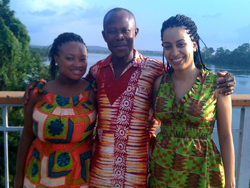 McConn and Houston also went back to Ghana in July 2010 as part of the study abroad class. 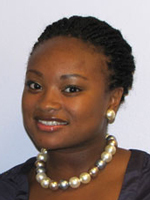 In September 2010, a Student Spotlight story was written about the students and appeared on the CLASS website. When the students returned from their first solo trip to Ghana in support of their new non-profit organization, the CLASS Office of Communication asked them to write about their experiences - and these are their stories. While students all over the country sat down to Thanksgiving dinner, Hannah and I traveled to Ghana, West Africa to carry out the mission of The Pencil Project. Although this trip was our third trip to Ghana, it was special. Not only were Hannah and I traveling alone, but the information gained from this trip would also serve as a component to an independent study class I created with Dr. James Conyers, director of the African American Studies program and Dr. Sheara Williams, associate professor in the Graduate College of Social Work. Following the success of donating 30,000 pencils in July and the anticipation of donating 20,000 more pencils this nagging question remained - is the Pencil Project making an impact? My goal for this trip was to answer that question. In addition to donating to four new schools, we also visited three previous beneficiaries of the Pencil Project to interview the administration and teachers about any impact made from receiving pencils. Teachers were able to save money because they did not have to spend personal funds on pencils for students who did not have them. In addition to donating and revisiting schools, we met with the Ghana Tourist Board, the Ghana Football Association, the Director of Panafest, and the Executive Director of Education. These meetings allowed The Pencil Project to gain exposure in Ghana and networking within the country. Moreover, we began the official Non- Governmental Organization (NGO) process by filing paperwork at the Ghanaian Attorney General's office. As a social work student, the opportunity to travel to Ghana enables me to indulge in both my passions: making a tangible impact in a disparate community and my love of culture. I am grateful for the opportunity the African American Studies Department at the University of Houston has afforded me and for the unwavering support of the College of Liberal Arts and Social Sciences and the Graduate College of Social Work. For more information please visit www.pencils4ghana.org. 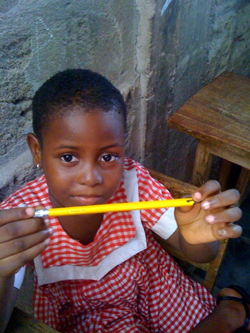 During the Thanksgiving break The Pencil Project donated 20,000 pencils to local schools in Ghana and conducted school follow-ups with recipients who had benefited from the 30,000 donated during July 2010. The highest point of the trip was when we were leaving the Volta region to stop at a small rural school Senchi Ferry Primary Methodist which happened to be the same school our Director Kwaku Passah attended in the late 1940s. There were about five long school buildings, each was a classroom staggered out so that there was an open area in the middle. We got out of the truck and as soon as we started opening the suitcases and the children saw the pencils they were all screaming with excitement and there was a lot of shoving to be near the table with the supplies. There was something about this reaction that set them apart from all the other schools. Maybe it was the risk they were willing to take to act so unruly in front of the headmaster. They were all so loud and full of life and to see this type of excitement over a pencil really struck me emotionally. The Pencil Project supplies pencils because it's a necessity for progressive education in Ghana, and I really never looked much further than that. These pencils give an unwritten gift of emotional happiness and well-being to children which in return has helped me in the discovery of who I am. 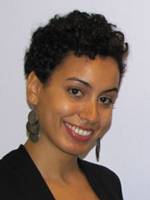 Read more about the African American Studies program.